This trendy decorated corner unit condo in the Imperial Lofts building is as functional as it is elegant. The kitchen, located in the old elevator shaft, features concrete counters, undermount sink, pearlized tile backsplash, two tone solid wood cabinetry, wall mounted wine rack and black / stainless steel appliances. Ebony stained hardwood, ceramic tile flooring, is as cultivated as it is practical. 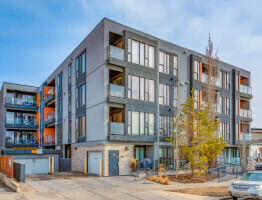 Contemporary tile surround a gas fireplace, incredible 15 foot ceilings and large corner windows offer impressive views of the downtown skyline. Fitted, roll-up blinds off a rich and stylish setting. A sophisticated redefined work station, offer an avant-garde look with wonderful storage capacity. 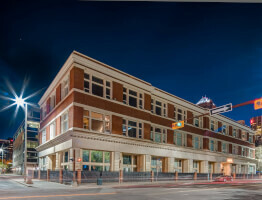 Sunterra Market, Downtown, 17 Avenue, the Stampede grounds; residents have wonderful access to a great mix of shops, cafes / restaurants right at their doorstep. Underground heated parking, in-suite laundry, storage locker, communal gym, games room and rooftop patio complete this contemporary residence. 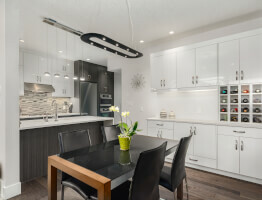 See why this condo was featured in Indoor Living Magazine in 2011.